Strolling the boardwalk and saw the commotion up ahead. Turns out it was folk feeding the pigeons and seagulls. 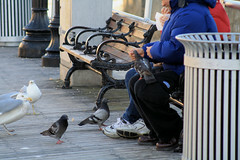 The guy even allowed the one pigeon to perch on top of his knee and eat from his hand. Now that's what I call a "Go Getter"
The pigeon decided he wasn't waiting around for scraps of crumbs on the boardwalk. So he took it to the next level... going straight to the source.